The western section of London's main shopping street is to be transformed into a pedestrian zone filled with public art, it was announced today. London mayor Sadiq Kahn has revealed plans to start imposing traffic restrictions along Oxford Street by the end of 2018, allowing the congested street to become a pedestrian-priority area. 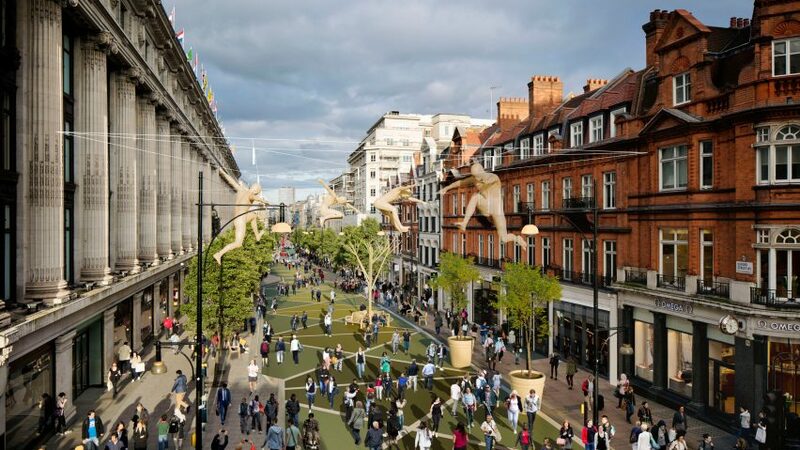 Visualisations show the pedestrianised zone stretching all the way from Oxford Circus to Selfridges, with colourful shapes painted over the pavement and public art suspended over the road. “This is a hugely exciting moment for the capital," Khan said in a statement. "Oxford Street is world famous with millions of visitors every year, and in just over a year the iconic part of the street west of Oxford Circus could be transformed into a traffic-free pedestrian boulevard." Oxford Street is one of the busiest shopping thoroughfares in Europe, with an estimated 500,000 pedestrians walking through it each day. Currently pedestrians share space with two lanes of traffic – meaning shoppers, tourists, residents and workers have to battle with streams of taxi cabs, rickshaws, buses and bicycles. In the new proposal, buses would be re-routed and taxi ranks expanded. Plus the road would be brought up to the same level as the pavement, making it more accessible for wheelchair users. Cyclists would be required to dismount in the area. However the proposals promise a separate consultation on implementing new cycle routes along quieter parallel roads either side of Oxford Street, to be held in the summer of 2018. Oxford Street would then be able accommodate a sequence of public plazas lined with trees and benches with 25 planned pedestrian crossings. Traffic would still run north to south across the road at certain points. An 800-metre piece of public art could be commissioned to line the new space. The discussion over whether to pedestrianise Oxford Street goes back years – as a result of frequently clogged pavements, eye-watering levels of air pollution and high numbers of traffic collisions. Between January 2012 and September 2015, a pedestrian was involved in a collision on Oxford Street every seven days, according to Kahn's office. And in May 2016, there was a fatal accident involving a pedestrian. The street has been pedestrianised for short-term periods in the past – usually weekends in the run up to Christmas. Kahn's proposal would build on these trials, aiming to make the street safer and more attractive to visitors. Limiting traffic would also help limit the rampant air pollution on the street – which frequently features on global lists of heavily polluted roads, thanks to excessive levels of nitrogen dioxide. The move would also help to prepare the area for the opening of the Elizabeth Line, the new Crossrail train line, expected to bring even more people to the area when it opens in late 2018. Projects are also underway to increase the capacity of London Underground stations at Bond Street and Tottenham Court Road, as part of what Transport for London (TfL) calls an "unprecedented level of investment in central London". TfL held a consultation on the future of Oxford Street in April 2017 and received over 12,000 responses. Pending a further public consultation – which closes 17 December 2017 – the pedestrianisation project will be implemented in three stages. The project is estimated to cost £60 million, which TfL hopes to fund with government and private sector money. Khan will be hoping the project is more popular than the public-realm project championed by previous mayor Boris Johnson – the Thomas Heatherwick-designed Garden Bridge. Filled with plants, the River Thames crossing was supposed to become a tourist destination, but questions mounted over spiralling costs and funding sources. Khan pulled the plug shortly after taking office, meaning £43 million of public money went to waste. Johnson was also behind the last revamp of Oxford Street – a £5 million project that saw a new crossing system implemented at Oxford Circus, encouraging people to cross in all directions.